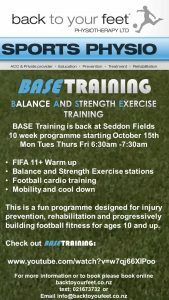 BASE (Balance And Strength Exercise) Training is an injury prevention and performance class incorporating the FIFA 11+ warm up (a proven way to reduce injuries and improve your football performance) followed by a circuit of Balance and Strength Exercises designed to get you fitter and stronger for your football. Book a BASE Session now! Back To Your Feet Physiotherapy run BASE Training sessions Mon, Tues, Thurs and Friday mornings at 06:30am- 07:30 am at Seddon Fields. Guaranteed to be a workout, the sessions combine interval strength training for all major muscle groups alongside running drills to help improve your agility and fitness. You can come by yourself or bring yourself a training partner! The programme is designed in such a way that we can accommodate all levels of players from 14 years old. Train like a pro, no matter what your ability is! Please note: All participants must wear turf boots (no metal studs). Please get in touch with us if you would like more information or book yourself into a BASE Training class. Need an appointment? Get in touch, we will do our best to see you ASAP!